Abode Srl. Our official blog. Everything Italian and more. Italian Real Estate is our business. : Umbrian town will be full of hot air! Umbrian town will be full of hot air! 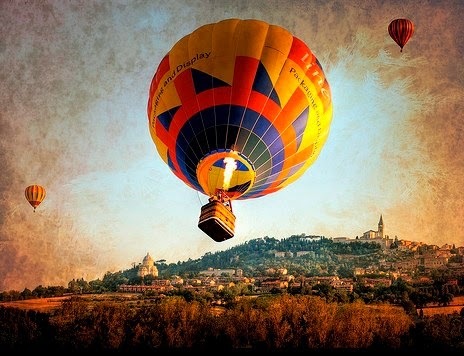 From July 7th to 22nd Todi will once more be hosting its annual hot air balloon Gran Premio, with some forty hot air balloons from all over the world gathering at Ponte Naia. Every morning at 6.30am there will be a colourful flight over Todi, plus a host of other activities and events. Among the event's most popular appointments is the Caccia alla Volpe hot air balloon 'fox hunt', in which all participants chasing a balloon that is given a fifteen minute head start. Special rates for anyone wishing to book themselves for a thrilling ride. Info: Mongolfiera Management tel. 075 8944480, todigranprix@tiscalinet.it.